The Masters was an incredibly concentrated year … and the objects I worked on were eclectic in nature. In the practical classes we had great support from our tutors… and we had access to the laboratories. I first worked on a Victorian Japanese marquetry writing desk from Lincoln Cathedral while in the second semester I worked on an Egyptian burial figure, a Victorian architectural tile, a painted frame and a 18th century Queen Anne doll. My favourite project was the Queen Anne doll, who was in a very poor state when I was handed her with extensive insect damage and physical damage to her painted gesso face…the different materials in which she was made imposed different problems, all of which then imposed their own problems on one another. As painted gesso was flaking off at every touch I decided to freeze her… I was then able to remove insect debris and casings as well as her dress which was discoloured. …Once the painted gesso and all the textiles were clean and dry the doll was redressed. Working on the doll introduced me to a range of materials I hadn’t worked on; wool, silk, cotton and leather, which developed my knowledge, skill set and experience. Throughout the year we also had four intensive taught weeks … and the practical and theoretical knowledge I have gained has enabled me to feel confident about my dissertation and continuing with my career development. 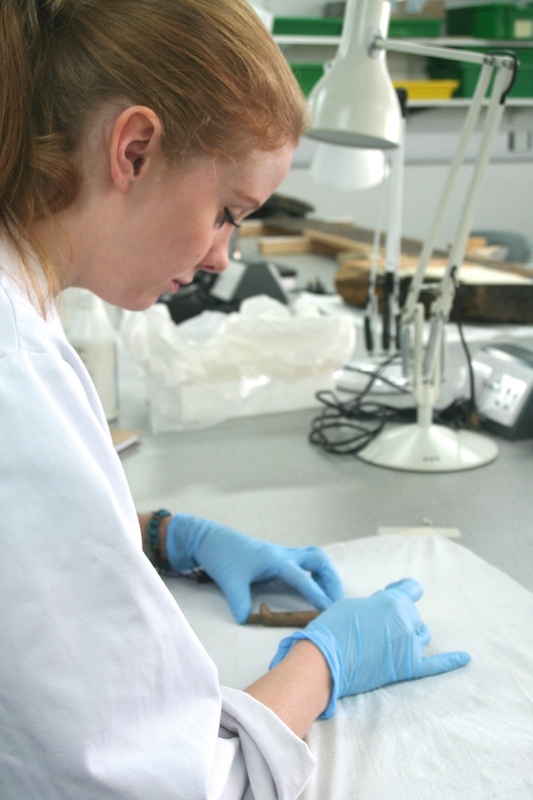 I was honoured to receive funding from the Anna Plowden Trust which helped towards my tuition costs and enabled me to further my knowledge and experience within the conservation sector as well as allowing me to undertake an invaluable internship at the Te Papa museum in New Zealand.